Thanks to President Trump, China appears to be trying to reign in the insane North Korean man-child Kim Jong-un for China’s President Xi Jinping understands well that the U.S. could and most likely will take unilateral action against the North Korean dictator if he keeps up his saber rattling and rocket launching. And with President Xi saying that China "is committed to the target of de-nuclearization on the peninsula, safeguarding peace and stability on the peninsula, and advocates resolving problems through peaceful means," it becomes apparent that Xi knows that to do so would benefit China’s economic pocketbook...but is there actually more to his words and even more at stake than seen at first glance. And yes...there is more at stake...much more...what with Kim Jong-un now threatening not just South Korea and Japan but threatening also to do a “mighty pre-emptive strike against the U.S.”...that is if his rockets do not keep falling into the sea. And these recent threats have seen China moving its military towards their shared border because Xi is wise enough to know that first, a war on the Korean peninsula would not serve China’s said pocketbook nor its pecking order on the world stage well and second, he also knows that a loony man-child like Kim Jung-un could just as easily turn on China... the very country that made and still finances his dictatorial bed. Translation: Trump made it clear that China must, no matter the cost to them, reign in Kim Jong-un for China not only needs bi-lateral trade deals and investments with the U.S., but with us now flexing our military muscle the dynamics in both the Middle East and the Far East have changed...as in the U.S. is now leading from the front having replaced Obama’s leading from behind. And that particular dynamic has common sense dictating that if China was smart they would switch sides in the North Korean standoff or at least call for the man-child to stand down...something they now seem somewhat to be doing. But if truth be told an actual outward switching of sides will not be that simple for China to do what with China being a big brother, a mother, a father, and an overseer all rolled into one in regards to North Korea. 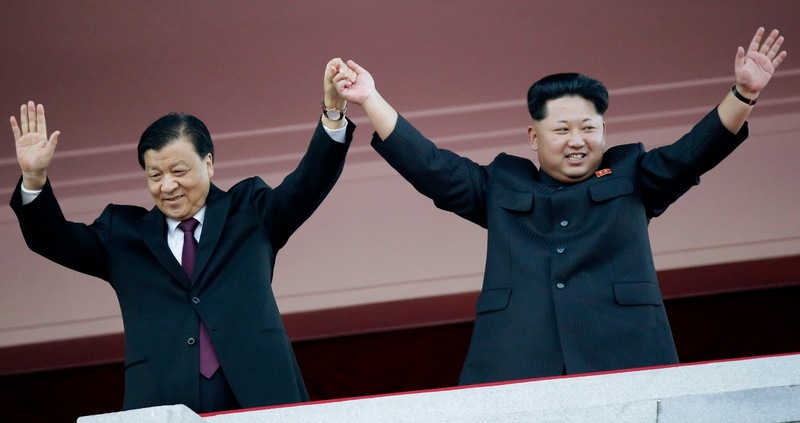 And this is but a symbiotic relationship that started when China’s Chairman Mao sent more than a million Chinese troops to fight in the Korean War, and that very act directly afforded Kim Jong-un’s grandfather, Kim Il-sung, the ability to keep control of the northern half of the Korean peninsula. But as the years have unfolded, China ever so slowly has started to see and digest the reality that the current regime of Kim Jong-un has done absolutely nothing to benefit China’s growing national interests nor for its growing economy...in fact the man-child has actually harmed China’s long-coveted super-power status in certain key ways. How so...with North Korea having the nuclear bomb...albeit at this time minus a successful delivery system...which in time please know they will get...and with North Korea lying on China’s eastern border...they can and do try to pretend that they are a major power broker. And as such with both threats and accusations they have held the true power brokers at bay...power brokers including China, Russia, and until just recently these United States. Thankfully, that scenario changed for the U.S. when President Trump recently ordered U.S. warships and aircraft carriers to the waters off North Korea’s coast. So, if an actual switching of sides by China might not be realistically feasible at this given point in time what with Chinese so-called ‘saving face’ also coming into play...know that in the near future it just might happen. And why...because China can ill-afford having a loon next door going ‘rogue’ without warning, and because the Chinese know that the U.S. dollar is mightier than North Korea’s saber rattling sword. And how so...first let’s look at a few key number facts* about both China’s and our U.S. economy and see who, if anybody, actually holds the much needed upper hand and why they do so. Fact: China, thanks to rapid industrialization, is the world's largest economy with $21.27 trillion in 2016 (with the allowing for adjusted purchasing power parity which is simply the exchange rate between two currencies equaling the ratio of the currencies' respective purchasing power); the European Union is second at $19.1 trillion; and the United States, thanks to Obama’s total economic disasters, is now in third place at $18.5 trillion. But even with this China’s economic growth slowed to 7.7% last year, it continues to show some signs of decelerating further. This has certain trading partners worried, especially those that export a lot of resources to China...trading partners like Brazil and Australia. Fact: as of this past February the U.S. debt to China stands at $1.059 trillion and climbing...as in 27.8% of the $3.8 trillion in Treasury bills, notes, and bonds held by foreign countries. The rest of the $19.9 trillion national debt is owned by either the American people or by the U.S. government itself, and that once thought unimaginable number of monies owed is again thanks to the free-for-all spending of one Barack HUSSEIN Obama. Fact: China exported about $482 billion in goods to the U.S.in 2015 (the latest finalized numbers available), more than any other country who exported goods to the U.S., and that is according to the Office of the United States Trade Representative. However, we exported just $116 billion in goods to China during the same year, putting our goods trade deficit at $366 billion. 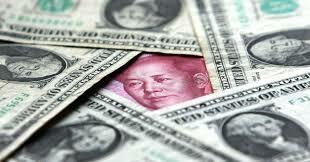 Fact: China buys U.S. debt to support the value of the dollar. And why...because China ties in its currency (the yuan) to the U.S. dollar, and devalues said currency when needed to keep its export prices competitive. And much to the chagrin of so many, it appears on the surface that it is China who holds the upper hand in regards to the above facts for China's role as America's largest banker, if you will, gives her needed bargaining leverage no matter how the media tries to claim it does not. And China quite often, and not so quietly, states that it will sell off part of its U.S. holdings (and that includes its land holdings) if we continue to pressure her to raise the yuan's value. In fact, since 2005, China raised the yuan's value by 33% against the dollar, and between 2014 and 2015, the dollar's strength increased by 25% causing China to allow the value of the yuan to decline. And why did they allow this...simply...this decline allowed China’s exports to remain competitive with Asian countries that did not tie their currency to the U.S. dollar. So where exactly does our economic upper hand come in or do we actually have one at all? First, to outwardly gain the economic upper hand within a short period of time some say we can always place tariffs of up to 45% (remember President Trump spoke about that during the campaign) on goods coming into the U.S. from China. However, doing this would actually hurt both our countries as we are a prime export market for Chinese goods, and so in turn U.S. companies would lose access to China's growing middle class. And then China, a country who has now for all intents and purposes actually embraced capitalism, can always choose to rid itself of its U.S. Treasuries which would negatively affect U.S. financial markets by its causing so-called downward ‘shifts’ in the dollar or interest rates. So where does our economic upper hand really lie...it lies with the fact that as China’s economy continues to develop no matter a temporary slowdown, they are now being forced to pay their workers more which in turn sees low-cost manufacturing jobs leaving China for even lower-cost countries like Vietnam, Bangladesh, and even (gasp) Mexico. And as per The Washington Post, China has also exhausted most of what economists call 'catch-up' growth from acquiring the technologies of more advanced markets for as countries catch up and get richer, their economic growth just tends to slow...and might I add while our economic growth is finally moving forward instead of just holding steady. So how and why does all this affect China’s sudden cooperation in reigning in North Korea’s man-child Kim Jong-un...or at least their trying to. First, China is North Korea’s chief economic so-called ‘pipeline’ and that means they supply Kim Jong-un with the oil and coal needed to keep his country operational, meaning if said oil and coal is not supplied then the North Korean economy...no matter how unstable it already is...would totally collapse in full. Second, if that collapse did happen the Kim family dynasty would obviously come to an end, which in turn could lead to a unified Korea (which by the way will eventually happen) led by the South, which is home to tens of thousands of American soldiers sitting right on China’s border. And lastly, that would be coupled with countless numbers of refugees from the north flooding into China which would negatively impact their economy...that is unless beneficial economic trade agreements were reached between Beijing and Washington...trade agreements that would bring into China enough cash to balance out all the new mouths they would now be forced to feed. And how does this new cooperation in turn affect the U.S...it allows the U.S. to have leverage over both any new trade agreements reached as the Chinese now know they need the increased trade and resulting cash flow in case Kim Jong-un does the unthinkable...as in turn on the so-called Chinese hand that feeds them. And that possibility is now starting to loom large what with China now doing what Kim Jong-un never thought they would do...as in suspend all imports of North Korean coal for the rest of this year. So in the end when push comes to shove, China does need us more than we need them for the dollar is indeed mightier than Kim Jong-un’s ever threatening sword.